November is here at last, and with it comes a new issue of Seamwork! In this issue we explore the notion of home and invite you to settle in for the season and get stitching. In Sew Like a Pro, Brooks Ann Camper walks you through upgrading your sewing space and tools to help you sew faster and get professional results. And in this month’s edition of Slow Sewing we chat with Kristine Vejar of A Verb for Keeping Warm about taking creative risks. We are also bringing you two fresh patterns, Monroe and Charlotte. This luxurious pair will bring a touch of glam to your loungewear. Monroe is a pair of lounge pants with a fitted yoke and flattering wide leg fit, and Charlotte is a lounge shirt reminiscent of the 1920s. 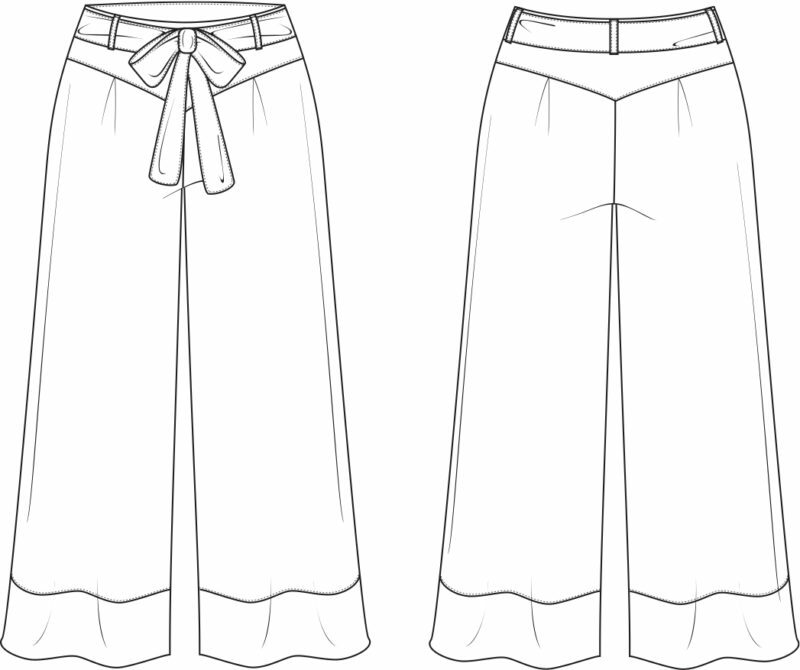 Monroe is a single pattern for both pajama pants and lounge pants. Made out of a luxurious silk, Monroe is elegant enough to wear at home or the office. Experiment with color blocking the yokes and leg cuffs, or substitute wide lace for the leg cuffs to create some very fancy pajamas. In any fabric, Monroe has a flattering silhouette and provides an exceptionally comfortable fit. It is also easy to accessorize—create entirely different looks just by changing from slippers to heels. Sleepwear doesn’t have to be boring or shapeless—and not even Victoria will know your secret. Charlotte is a tunic-style blouse with two lengths and very simple construction. Similar to Monroe in terms of style and wear, Charlotte is simple enough for sleepwear and lounging at home; but with the right fabrics, such as cotton or wool crepe, Charlotte becomes a real show-stopper. With long, slimming rectangular panels and layered sleeve panels, Charlotte easily lends itself to color blocking. This garment is simple but elegant, and easy to customize. So channel your inner glam with Charlotte! Here’s a closer look at Monroe and Charlotte. Home is Where the Sewing Machine is: How do you define home? Dressed for Success: A look at the life and work of the iconic Edith Head, by Betsy Blodgett. Sew Like a Pro: Upgrade your sewing with professional-quality tools, furnishings, and fabrics, by Brooks Ann Camper. Professional Profile: Alison Smith: This humble sewing master shares her story, tips, and industry techniques, by Katie Whittle. 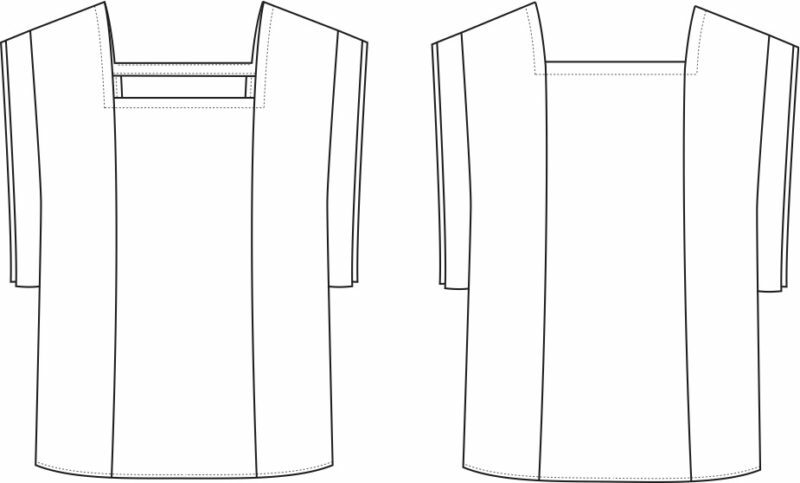 Block Paper Scissors: Turn Charlotte into a nightgown with side slits, by Anna Aguirre. Creative Risks: Kristine Vejar on stretching yourself, by Jessica Yen. Sewing Specifics: Add some dainty charm to your hems. Seamworker’s Closet: Take a peek into a Seamworker’s closet for inspiring finished projects. Wally’s Wisdom: How do I know if I need a bust adjustment? I haven’t had an opportunity to read this month’s issue of Seamwork, but thank you for creating this beautiful loungewear. I’ve been hoping to find a pattern that I could make and wear when I come home after a long day of commuting from and to work. I’m going to enjoy making plans and choosing fabric for this project. Hi Sheri! Monroe and Charlotte sound like a perfect fit! I love that the patterns this month are comfortable and chic, perfect for lounging after a day of hard work. I’ll admit, I had considered cancelling my subscription (no offense!) as I haven’t had a lot of time to sew with my new job, and some of the previous pattern offerings weren’t my style. I am so glad I didn’t, because these are just lovely And exactly the types of garments that have been catching my eye lately! Bravo on the patterns and the look book, which is stunning. Can’t wait to see garments made up and to sew these two beauties myself. Haven’t heard of Edith Head in years. Thanks for the article. It was great. Lovely patterns, looking forward to trying them. Silly question, but if you made pajamas out of silk fabric, are you going to wash them at home? I can’t quite see taking pjs to the cleaners. Hi Katherine, That is a great question. Usually, when I have made loungewear from silk, I pretreat the fabric by washing it by hand with a small amount of gentle detergent and hang dry. Then once I have made the fabric into a garment, I wash it the same manner. If you are using silk satin this might dull the surface of the fabric very slightly, but nothing drastic at all. I’ve enjoyed the shift I noticed in the past couple issues toward more vintage-inspired garments. Also the thoughtful addition of patterns that fill wardrobe holes! Lovely. Alison Smith! Well done! I love her Craftsy classes. That loungewear looks beautiful. There is an error in the caption on page 15 in the Edith Head article. Edith is on her knees and holding up her hands, which means she was leaving her handprints at Graumann’s Chinese Theatre, not getting her star on the walk of fame. Hi Paula! Thank you for noticing that. I will make sure it is corrected asap.